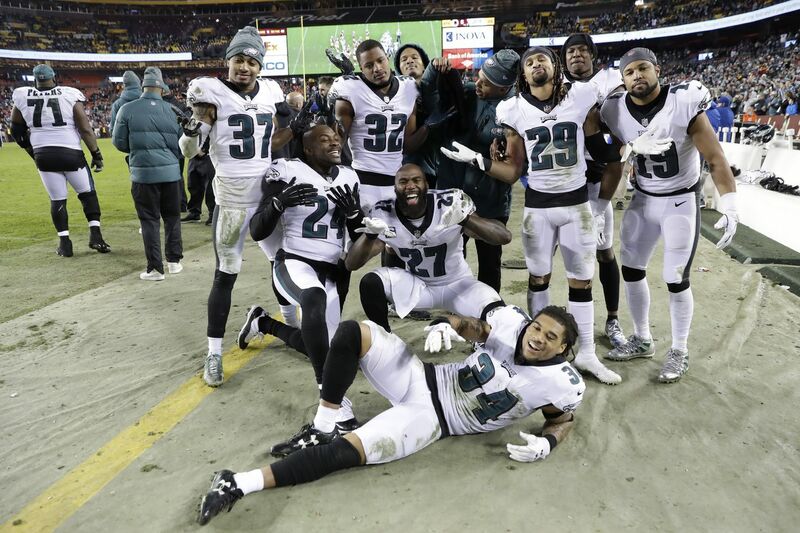 It seemed nearly impossible just a few months ago, but it happened: the Eagles are going to the playoffs. After cruising to five wins in the final six games (we can just forget that loss to the Cowboys, right? ), the Eagles finished at 9-7. They did their part on Sunday, shutting out Washington to ensure they still had a shot at the postseason. But it required some help, and they got it -- plenty of people at FedEx Field turned into Bears fans for the afternoon, and were rewarded when Chicago beat Minnesota 24-10 to end the Vikings' chances to return the postseason. The reaction around social media was immediate, and hilarious. But we’ll get to that in a minute. Let’s take a spin through what people were saying before, during and after a wild Sunday slate. Things started off great for Washington this season. Then, after their starting quarterback Alex Smith suffered a gruesome season-ending injury, it all started to unravel. Couple that with some questionable decisions made by the front office, and it’s no surprise that fans were feeling a bit disenfranchised about the whole season. Which means the ones who did show up -- and who weren’t dressed in Eagles gear -- booed the team as it took the field. Right out of the gate, Nick Foles threw an interception. Trust me -- that was one of the only Washington highlights of the afternoon. Meanwhile, fans were watching the scoreboards and refreshing at ESPN app constantly, trying to keep up with what was happening in the afternoon’s other games: Bears-Vikings and Rams-49ers. The Rams needed to beat the lowly 49ers to guarantee a first-round bye, so Eagles fans wanted to make sure the Bears still had something to play for -- Chicago needed to win to have a shot at that bye, too. Alshon Jeffery and Foles continued their chemistry through the air, especially on this deep play to set up Jake Elliott’s first-quarter field goal. See Jeff McLane’s film breakdown, which explores their connection -- especially on a deep ball -- here. Fans have been loving Jeffery’s emergence in these past few weeks. Jeffery led all Eagles receivers with five catches for 59 yards and a touchdown -- this grab over Washington cornerback Josh Norman late in the second quarter. And again, people were loving it. Alshon Jeffery is a top 5 receiver. Don’t even @. The Eagles entered halftime with a 10-0 lead, and it seemed like the hapless Redskins weren’t going to manage much in the second half. Yes, it was time to start looking ahead to next weekend. Something else to consider in CHI-MIN: If you're the Bears coaching staff and you see what your defense can do against the Vikings, wouldn't you rather see the Vikings next week than the defending Super Bowl champs with five wins in six weeks? Speaking of Bears-Vikings, things weren’t going well up in Minneapolis. Remember when the Vikings made ex-Washington quarterback Kirk Cousins a lot richer during the offseason? That team just finished 8-7-1 and out of the playoffs. But that doesn’t mean everyone cheering for the Eagles was calm. Luckily for Eagles fans, Saint Nick Foles showed up to play. He broke a team record for the most consecutive completions in a single game -- 19. Nick Foles has completed 19 consecutive completions -- the most in a single game in Eagles history. Then, he stretched that team record into 23, which was inching closer and closer to the NFL’s single-game record held by Philip Rivers, who set that mark last month. Nick Foles is one completion shy of the NFL record for consecutive completions in a game. He tied the mark on a pass to Golden Tate in the third quarter. #Eagles QB Nick Foles just tied the NFL record for consecutive completions in a game with 25. (Philip Rivers, 2018). And then he threw an incompletion to end his streak tied with Rivers at 25. On the next play, Foles found Nelson Agholor in the end zone to stretch the Eagles' lead to 17 (it was a touchdown that had to be reviewed, though). And the home crowd down in Landover was happy about it. At this point, it was clear -- the Eagles were going to win this game. It was time for the networks to consider switching over to what we all wanted to watch instead -- Bears-Vikings. So @FOXSports might have to switch to Bears-Vikings game in Philly. The Eagles' probable win was history-making in itself. Nick Foles went to the locker room. Foles was sent to the locker room with a chest injury. He was ruled questionable to return. Nick Foles has a chest injury and is questionable to return for the #Eagles. In other news, Carson Wentz's back is feeling muuuuuuuuuuuuuch better. But Nate Sudfeld entered the game in place of Foles, and promptly threw the first touchdown pass of his NFL career. Sudfeld to Nelson Agholor for a 22-yard TD. First TD of his career. He gets the ball. This was a revenge score for Sudfeld, who was drafted by Washington in 2016. Another touchdown for Agholor. Touchdown pass from Nate Sudfeld, whom the Redskins drafted in 2016 but cut last season. Eagles scooped him up and have been grooming him ever since. Agholor handed the ball to a fan after scoring. Good for that kid! Not great for Sudfeld, who would have preferred to hold onto it. My colleague David Maialetti captured the moment perfectly. Look at the smile on that kid’s face! Eagles quarterback Nate Sudfeld asks for the football back after wide reciever Nelson Agholor gave it to a fan. It was time to start talking about Sudfeld seriously. Is he the quarterback of the future? And at that point, FedEx Field turned into Lincoln Financial Field South. And everyone had jokes about it. Who could forget Bill Swerski’s super fans? For the Eagles, the records kept piling up. Fletcher Cox got his name in the books after sacking Washington quarterback Josh Johnson in the fourth. Fletcher Cox with his first double-digit sack season. ITS OFFICIALLY A CAREER SEASON FOR FLETCHER COX. With no help inside at times this season and a lack of depth outside. What a monster. And then, it was time to celebrate. Carson Wentz, out with a back injury, tweeted from the locker room after the Eagles' playoff berth was official. Corey Clement, who has been stuck on injured reserve, chimed in on social media too. Are we surprised, around the holiday season, that Saint Nick was the one leading the way? Rob McElhenney from It’s Always Sunny in Philadelphia chimed in. Let’s not forget Mac and the gang celebrated the Super Bowl in person in February, and on television this fall. The Eagles' counterparts across the street shared their congratulations, too. And the Philadelphia Police Department gave us a heads up -- they aren’t greasing poles ... yet.